Richard Nongard and I will be covering how we reach out to potential clients suffering from functional syndromes as well as how we reach out to health care professionals in our 1-Day Workshop in Dallas (Apr 19th). I will also be covering reaching out to your health care communities in my solo 2-day Certified Hypnosis Pain Relief Educator training in NYC (Apr 28-29). Dan Cleary and I will also be covering tmainstreaming your practices in our two-day post IMDHA/IACT conference Certified Hypnosis Pain Relief Educator training (May 21st and 22nd). If you are unable to attend one or more these upcoming live conferences or my solo training, do not despair, Scott Sandland and I cover this in our 3-Day Dynamic Pain Control Workshop which is available as a 6 DVD set. Emotional eating can be triggered by boredom, anxiety, stress, loneliness, pleasure and other emotions—it is not a response to true, physical hunger. Hypnosis is an enhanced state of consciousness during which attention is highly focused and responsive to suggestions for behavioral changes. Hypnosis gently connects to the feelings that trigger emotional eating and creates healthier reactions.This workshop consists of a 60-minute group imagery session followed by a private one-on-one hypnosis session that will address your personal weight loss goals. 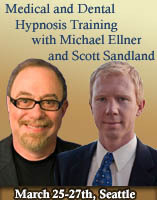 About the Instructor: Michael Ellner, CHt., is an award-winning certified medical hypnotist in private practice in New York. Specializing in hypnosis for weight loss, smoking cessation and pain management, Michael is able to connect on a deep level with clients and help them reach their wellness goals. 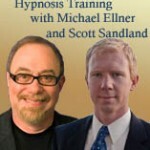 Michael teaches advanced courses in mind-body medicine and hypnosis throughout North America and South Africa and is a featured instructor of hypnotic pain relief at PAINWeek, an annual conference for clinicians. Useful info. Lucky me I discovered your website by accident, and I am surprised why this twist of fate didn’t happened earlier! I bookmarked it. To anyone trying to decide what classes to take at the IMDHA Conference… take the Pain Relief class given by Michael Ellner & Dan Cleary! I took the class in 2008, & it was one of the best classes I have ever taken. I have been a registered nurse for 28 years now & a C.Ht for 10 years … so I have taken a lot of classes. Not only was it enjoyable, but I use the information I learned there everyday. On behalf of Dan and myself — I thank you and we deeply appreciate your post!